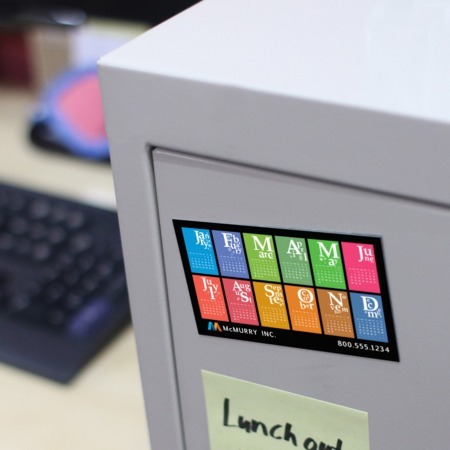 Magnetic calendar printing makes it possible to create brand impressions in homes and workspaces for at least a year. Calendars are always a welcome gift and magnetic calendars can easily stick on fridges, filing cabinets, or lockers for quick reference. These neat little marketing tools make it easy to build a brand presence and collect impressions every time someone checks their calendar. Our custom magnetic calendars can be made in 2” x 3.5”, the size of a standard business card, which makes them an excellent alternative to business cards as well. They can also be made in sizes as large as 4” x 8”. The durable magnetic stock won’t let your brand (and critical contact information) down either, and will last well over a year with no problem. Print calendar magnets as gifts for customers, or as part of a suite of promotional materials. It’s easy. Just download our free magnetic calendar templates from the templates tab on this page. These should help you account for the bleed, proofing, and other technical details needed to make accurate card calendars. You can also upload an existing design, or make your own calendar from scratch with our design tool.